We finished first MIXED multihull and first Belgian team in the Texel Dutch Open on our Falcon F16! We are very pleased with our 19th place out of 68 top competitors. This was a very high level racing field, with again strong winds, crowded starts and huge waves. A more detailed report of our week in Texel will follow this week. In the mean time have a look at the results of the Texel Dutch Open and enjoy all the action pictures taken by Thom Touw and Boot in Beeld. First weekend of June we had our 3rd race in a row: the Belgian Multihull Championship, 2 days of racing and 1 day a complimentary raid for those who wanted, with a seperate ranking. Start on Thursday at 1 PM, 4 races, we managed to sail consistently and scored a 10, 9, 10, 11. We were not really happy with the first 2 races. No boat speed, bad communication on board and some tactic errors. The last 2 races we decided to talk again :-) and we managed to get our head out of the boat. On the last race we saw a lot of capsizes, key here was to sail safe and finish! Unfortunately on the last downwind race when going out to trap my adjustable trapeze unleashed and I was waterskiing behind the boat on the lowest position of the trap. We were going fast, there were lots of waves and I didn't have the strenght to pull myself up again. Not a good situation! Gill took over the kite, tried to steer dead downwind and pull me up all at the same time. I tasted a lot of salty sea water! For what felt like minutes I was hanging there, trying to get back on, trying not to panick (not one of my strong points hehe). I asked Gill to hand me my adjustable trap so I could pull myself up higher, he did and finally we managed to get me back on board. Owkay, I was beat, totally done, but we still had to finish. We did and we managed to come in 11th that race, so I guess alot of other crews retired or capsized. With the weather predictions like they were we decided not to sail the raid on Friday and to just relax and focus our attention on the racing on Saturday. Good decision. Only 9 teams finished the raid, in heavy conditions, alot of wind and huge waves. On Saturday the day started with such light wind! It was very serene drifting to the racing area. It felt so surreal, hardly 2 BFT while the predictions were for again 5 to 6 BFT. But we didn't have to worry, right after we got to the starting area, the wind flew in, BAM, right away 4 BFT, rising steadily again to almost 6 BFT after the last race (we did 2 that day). We scored a 9 and a 9, how consistent :-) that day, putting us on a final 8th place for the Open Belgian Multihull Championship! Verry happy with this result altough we now we still can improve a lot, heavy winds are not our cup of tea yet, but with all this practising lately we sure have learnt alot! Verry happy to finish first MIXED team in this Belgiam Championship on our Falcon F16. This is why I love sailing with Gill, these results make us feel very good about our skills and our boat. 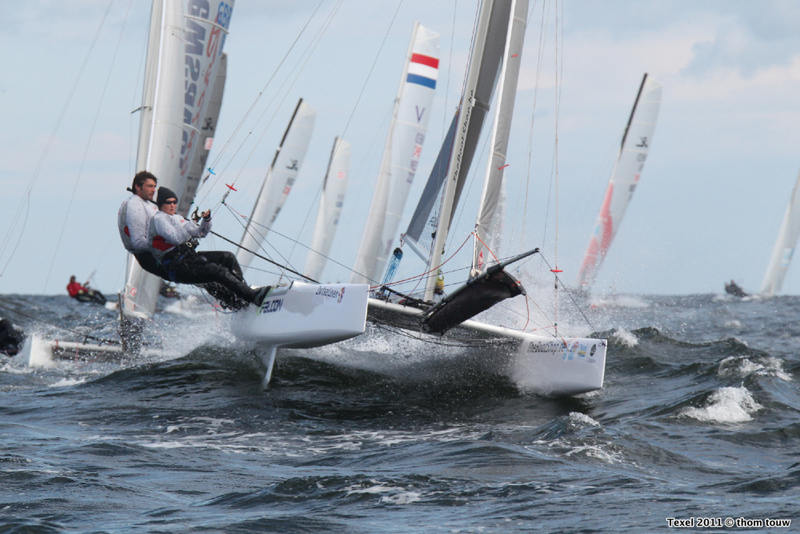 Now up to Texel for the Texel Dutch Open and Round Texel. We will keep you posted!